Glaston is the leading UK supplier of HPC air blowers. We can provide their full range of innovative rotary and screw blowers. Our selection of precision German engineered air blowers offer efficient air delivery, with the added benefit of minimal operating and maintenance costs. Contact Glaston today to secure your HPC air blower. As the intake air passes through a rotary blower’s flow chamber, its volume remains constant (isochoric process). Actual compression takes place outside of the blower block with the accumulation of the air mass taking place in the subsequent process. This “adaptive” compression always produces only the amount of pressure needed by the process. This makes rotary blowers particularly suitable for applications with a relatively high proportion of idling and/or heavily fluctuating pressure. As it is being conveyed through the screw compression block, the entropy of the intake air remains virtually constant (isentropic). Compression takes place in the block, where the air volume is continuously reduced up until it reaches the block outlet and is pushed out against the pressure. The lower compression effort required to achieve the same air volume results in lower energy consumption. Screw blowers are ideally suited for applications with a near constant pressure demand and which require long running periods. HPC COMPACT blowers are designed to incur minimal operating and maintenance costs and to ensure maximum reliability. Furthermore, blowers equipped with an integrated control system and star-delta starter, or frequency converter (for flexible speed control), significantly reduce the amount of work required for planning, installation, certification, documentation and commissioning. Together with their minimal maintenance and service requirement, these versatile blowers ensure lowest possible life cycle costs. COMPACT blowers offer air delivery of 0.5 to 74 m3/min, pressure up to 1000 mbar and vacuum to 500 mbar. HPC’s OMEGA blower blocks offer air deliveries from 1.5 to 160 m3/min and are suitable for operation up to 1000 mbar(g) and vacuum to 500 mbar. This means that the smallest and most efficient block can be chosen for any particular application, which is not only a benefit in terms of investment cost, but also significantly reduces operating costs, as smaller, fast-turning blocks are more efficient than larger slow-turning models. In addition, the faster airflow of the smaller blocks provides more effective cooling, consequently enhancing durability still further. The rotors in HPC’s new DBS, EBS and FBS series screw blowers are descended from the world-renowned SIGMA PROFILE and have been designed to meet the specialised needs associated with blower applications. 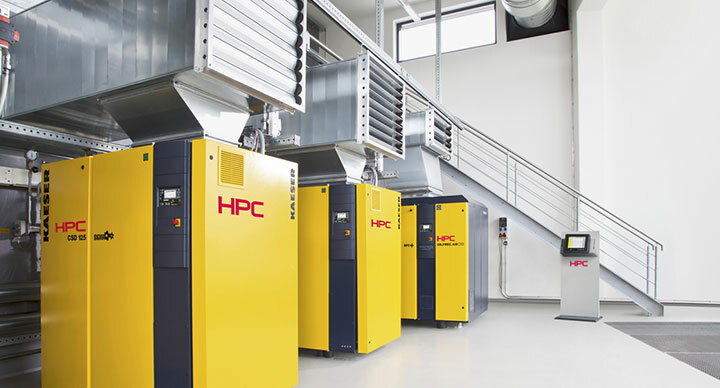 So, just like their compressor counterparts, HPC’s screw blowers deliver more air and more savings. Together, the blower airend and the premium quality mechanical and electrical components create a powerful, energy-efficient turnkey blower system with forward-thinking design. These innovative blowers provide a flow rate of 6 to 67 m3/min and a pressure differential up to 1.1 bar.